It wasn't that long ago that women were denied entry into distance running races. Despite records of women having completed marathons in the late 19th and early 20th centuries, prior to 1968 women were not allowed to compete. Many believed that females simply weren't fit for such athletic feats. And so, decade after decade, officials declared that women had no place in the race. This didn't stop women from running, of course. There's an almost primal drive that compels some humans to move, to push, and to explore. Despite my love for my comfy chair, blankets, and lap dog, I feel that drive. I run to think, to quiet my thinking, to let out stress, to see the world, to appreciate nature, to feel alive. I race myself, I cheer on others, and I love going further than I've ever gone before. I simply can't fathom being told I'm not cut out for the challenge. Just nine years before I was born, a determined young woman decided to show the world that despite policy, her place was not on the sidelines. On April 19, 1967, Kathrine Switzer entered the all-male Boston Marathon, having signed up with just her initials. That cold, rainy morning, with three male friends at her side and significant training under her belt, she stepped onto the starting line. Off they went. Word spread quickly that a woman had infiltrated, and though fellow runners supported her effort, race director Jock Semple made it his goal to remove her. Several miles into the race, having caught up on a truck, Semple lunged for Switzer, attempting to pull her off the course and yelling, "Get the hell out of my race and give me that race number." Fortunately, two things occurred: Switzer's friends sprang into action, and a photographer captured the scene. While one of Kathrine's friends struggled to loosen Semple's grip, Kathrine's 235-pound boyfriend, Tom, channeled his inner hockey player and cross-checked the old man. Semple went flying. Momentarily concerned for his well-being, Tom looked to Kathrine and said but three words: "Run like hell." And that she did. Kathrine finished the Boston Marathon. She completed the distance in four hours and twenty minutes. And yet her finish was just the beginning. Her efforts, and the media attention from that race, helped compel the running community to officially recognize women as endurance athletes and welcome their participation. Kathrine went on to run 35 marathons, winning the women's division of New York in 1974, and achieving a personal best of 2:51 in Boston the following year. Two hours and fifty one minutes. Were I to quit my job, train full time, tie on roller skates and a jet pack, I couldn't touch that time. It's that good. Thankfully, I've never experienced the kind of discrimination Switzer and her contemporaries did. 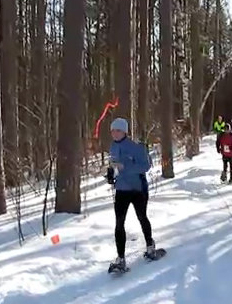 Though a few years ago, I did encounter an older gentleman who saw me on the starting line of a long-distance winter trail race and asked me if I was in the wrong location. The short course began on the other side of the hill. I told him I was indeed in the right place and smiled quietly as I passed him at the halfway mark. He never caught up. I did applaud him as he crossed the finish line, though the hot chocolate I was holding made it difficult. I share Switzer's story with my students each year, as there are too many life lessons from it not to. I ask them to ponder the courage it took Switzer and other pioneers to challenge the status quo. I ask them to think about what might have happened if the photographer had not captured the interaction between Semple, Switzer, and her peers. I ask them if such photos were captured and published today, how the Web would likely affect policy change. I ask them if anyone has ever conveyed to them, directly or indirectly, that for some event or activity, they were better suited for the sidelines. I wish I could be there to cross-check anything that attempts to hold my students back. But I know I can't. So instead I hope to help them discover how determination, hard work, and a good team of supporters can get them through just about anything in life. And I hope they come to know that no matter what "race" their passion drives them to, nobody can tell them that they don't belong. I want every one of my students to know that from now on I've got her back, and I'll be that little voice in her heart telling her to run like hell. You have a passion and aptness for making connections, Ms. Edson. Some bloggers and educators simply scratch the surface with connecting students, but you find rich, profound examples that are easily applicable to their lives. These examples are real, moving, and timeless. Your students can easily make the connection while you provoke their thinking further with poignant questions. This post is just another prime example of your talent for connecting teenage girls to the bold, passionate women who came before them. They are lucky to have you as their sage. An amazing story! That photographer captured a great moment. Sarah, I love how you describe how you make Kathy Switzer's story relevant to your students today. To middle schoolers, 1967 is ancient history; you do an excellent job in bringing it forward to the present. Surely your students have plenty of people telling them they can't do something. Another inspiring marathoner story you may wish to share with them is that of Grete Waitz, a middle distance runner who was supposed to drop out of the NYC Marathon after setting the pace, but kept running and set a world's record; which she continually lowered over the next 7 years and showed women could compete with men. She was the only woman to finish in the top 100 that year; last year, more than a dozen women did. Another great post, Sarah. Thank you. Please continue to share your life with us. You have so many defining moments that are worthy of sharing.